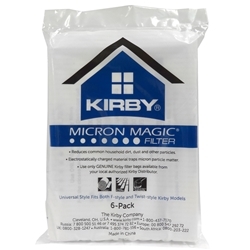 Kirby Vacuum Universal Fit Allergen Reduction Bags. The new Kirby Universal Fit Vacuum Cleaner Bags takes the guess work out of buying most Kirby Bags. In simple terms, if your Kirby was built in 1985 to present, these bags will fit and also offer you the highest level of filtration Kirby offers. Reduces common household dust, pollens, mites, and other particles. Electronically charged material traps micron particle matter. No twisting required with tab locks that keep the bag in place.